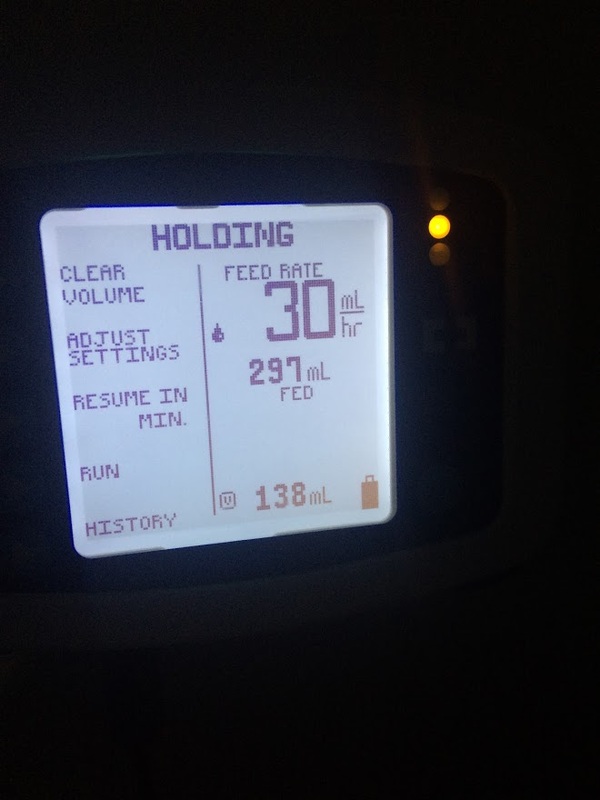 We began overnight continuous feeds recently and it’s been such a game changer! 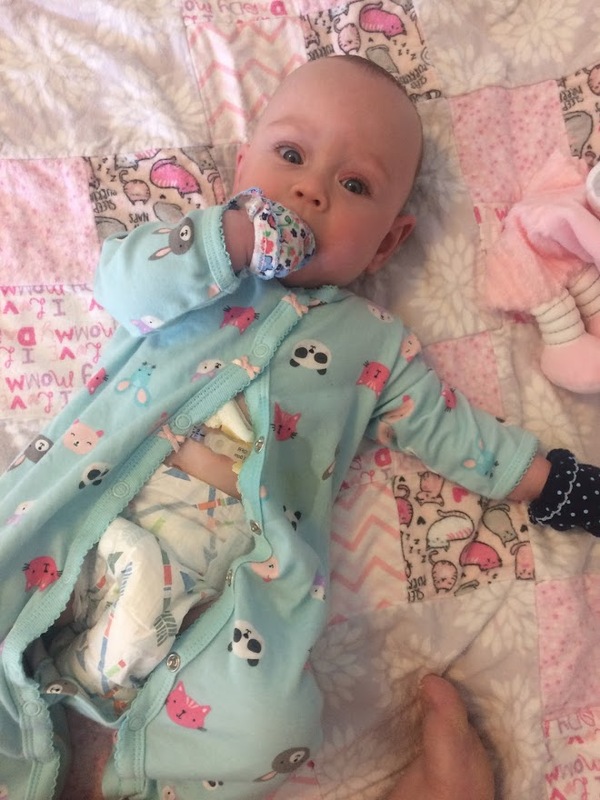 Isabella has trouble gaining weight and was once slapped with the terrible diagnosis of “failure to thrive.” There are many reasons why she can’t eat by mouth, but for this post I’ll focus in on what an overnight continuous feed looks like for us. Disclaimer: All of the feed rates/information is specific to Isabella and Isabella only. We receive recipes/directions from a Gastroenterologist and Dietician. If you would like to try continuous feeds, please connect with a medical professional. I can eat while I sleep, what’s your superpower? I absolutely love the cute Honest Company diapers with the apples. We haven’t been able to share the wonder and beauty of Fall with Bella outside, but have decorated and used fun Fall things around the house…like these diapers. Before bed, we put Bella in her pajamas and hook her up to her extension set. 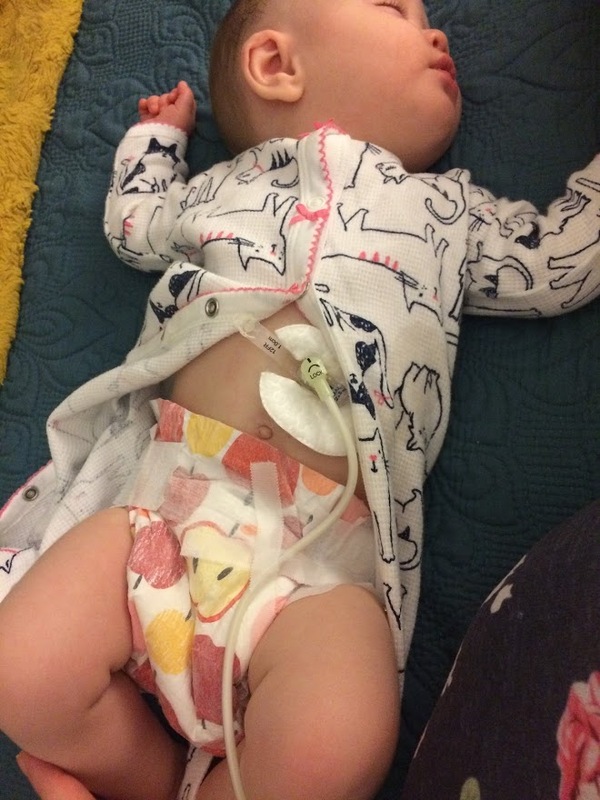 (I read it was best to attach the tubing to her diaper. I’ve gone away from that because we change her diaper throughout the night.) What you see here is her Mini One Feeding Tube attached to her extension set. We then give meds and her feed through the extension. The extension is good for an entire week. The feeding bag, which is filled with formula and attaches to the pump, is only good for 24hrs. (Yes, we throw away a pump bag and tubing every single day. It’s a crazy amount of waste). For the first night I had Bella sleep right next to me. I was very nervous about her strangling herself, pulling her button out, or vomiting and choking/aspirating. Here you can see Bella is hooked up to the pump tubing, IV pole, and extension set. It went amazingly. She didn’t even vomit! I woke up a lot of check on her but she seemed so happy and content. When I woke up I realized I had gotten SO MUCH SLEEP and so had she. It was crazy. I’m used to only getting 5 hours, interrupted. To switch to 8 hours was a massive blessing. Why Do Overnight Feeds Help Isabella? 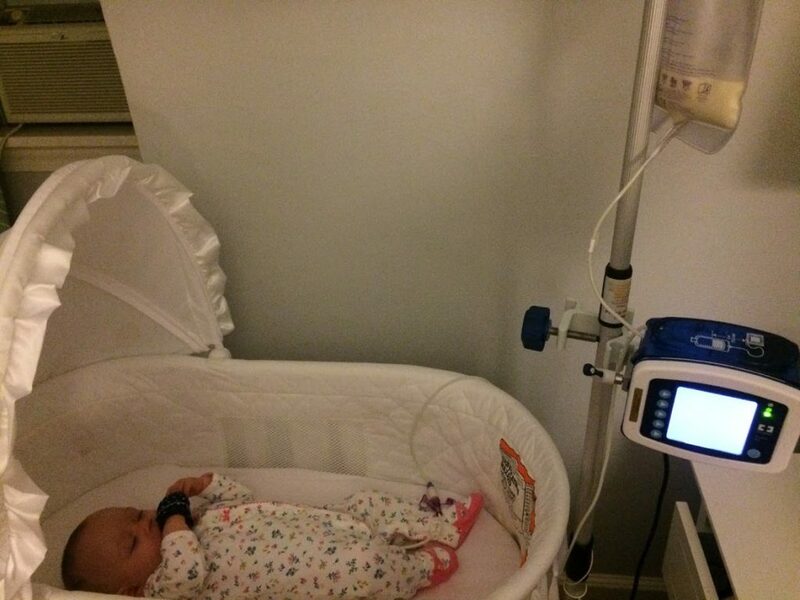 Overnight continuous feeds work well because Isabella has GERD (severe acid reflux) and a premature GI system. 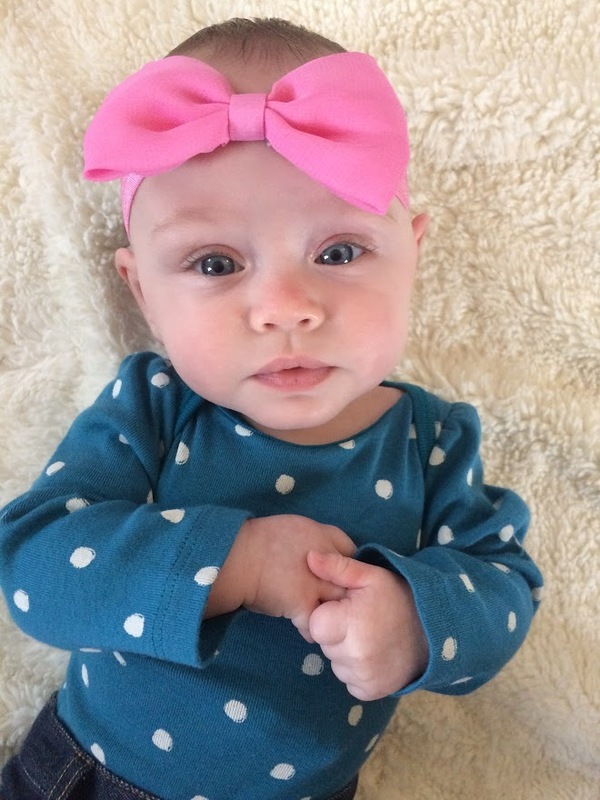 She is unable to take large volumes of formula at a time via feeding tube without throwing it up or being in pain. The goal of a continuous feed is to ensure she gets the nutrition she needs. 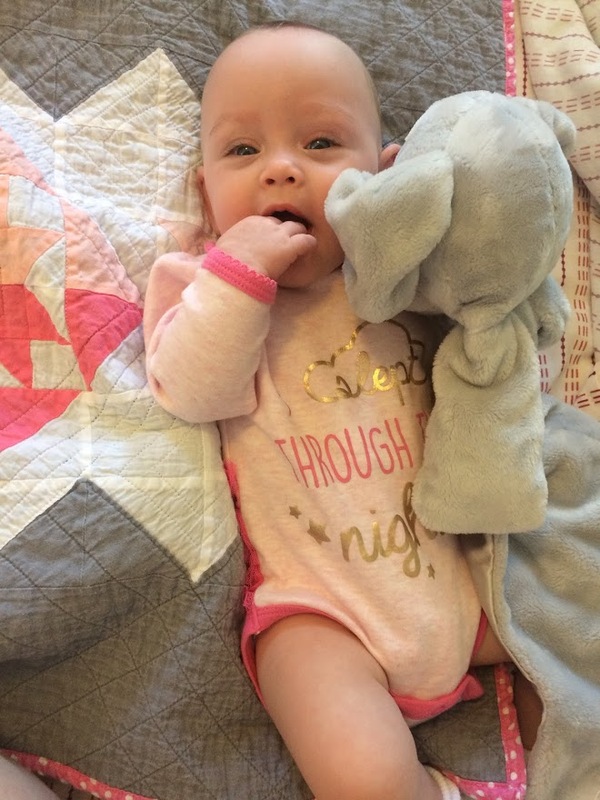 The hope is that the very tiny amount of volume she gets per minute will be tolerated well and she will be less likely to vomit with less in her stomach. It also helps that she can rest uninterrupted. Of course this is an added bonus to us! We have been on a “newborn” schedule until now (7 months) and her feeds were taking us a minimum of an hour and a half. We would need to hold her upright for an hour during the feed and then another 30 minutes to help prevent vomiting. Even then she would throw up quite a lot. To be completely honest we would bring ice packs to bed with us while feeding her to stay awake. We would blare our TV and talk to each other or watch movies. We couldn’t fall asleep during her feeds and it was very exhausting. At the time when her vomiting was at its worst we were feeding her 8x a day. To do the feed, hold her, prep the pump, etc, it was 2 hours each time. 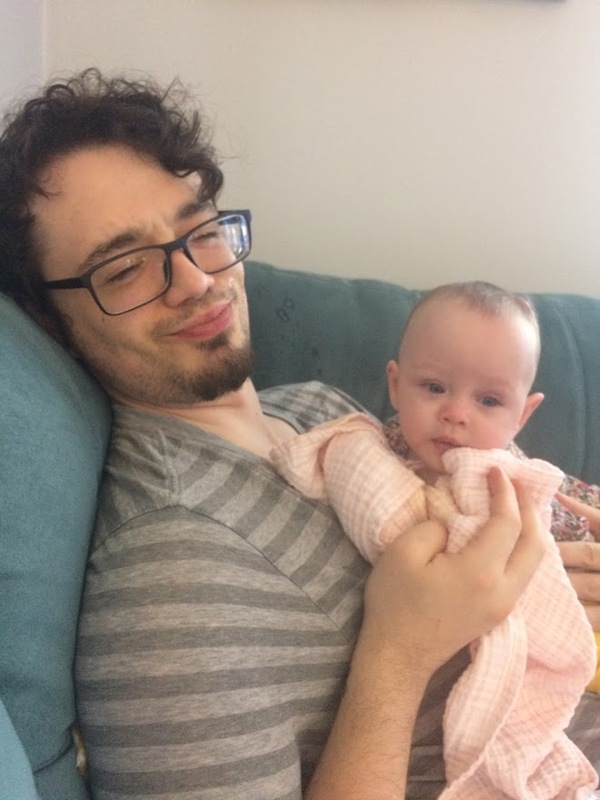 We literally spent 16 hours a day feeding Bella. Setting Bella’s Pump, How Does It Work? The pump can be set for different rates and amounts of volume for her to receive. For Bella, we give her 30ml of a specific formula custom for her every hour. That’s 1/2 an ounce an hour. Or, 1/2ml per minute. It’s basically like an IV drip, only with formula. We allow this to run from 10pm until 9am. The formula is good to be hung for 4 hours. 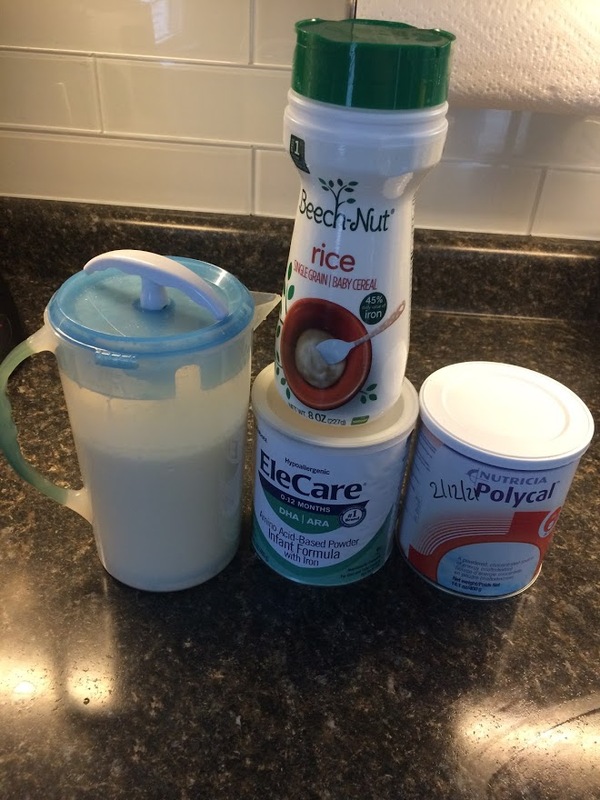 We wake up 2x to refill the pump bag with fresh formula mixed up and prepped in the fridge. Why Do You Wake Up? We wake up at 2am and 6am. At this time we rewarm a bottle and add the liquid to the pump bag. We also check on Bella’s tubing, change her diaper, and check for leaking. At 2am I also give her a medication that I push through her tubing with a syringe. At 9am (or later if she’s still sleeping and we can squeeze a bit extra formula in) her alarm on her pump will sound and I will turn it off. The alarm sounds if the bag is empty, but we set our own alarms. We certainly don’t want to forget to refill the bag or else the pump will pump air into her belly! That can be very painful for a little one. Above you can see that her Gtube sometimes leaks. We have to change her outfit and sheets when this happens. 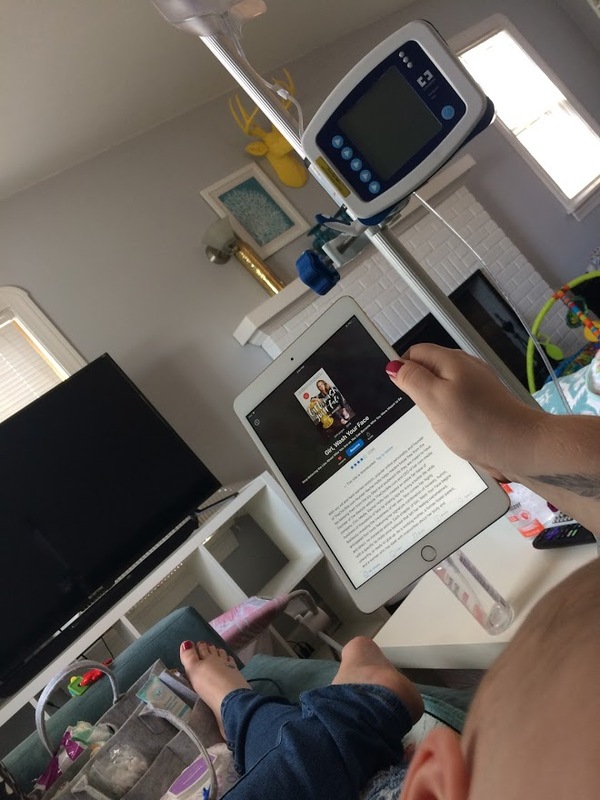 Mommy can read while feeding Bella! Does She Still Eat During The Day? Yes! Bella still gets fed 3x during the day. We give her 75ml over an hour at 12pm, 4pm, and 8pm. She gets a little over 1ml an hour. 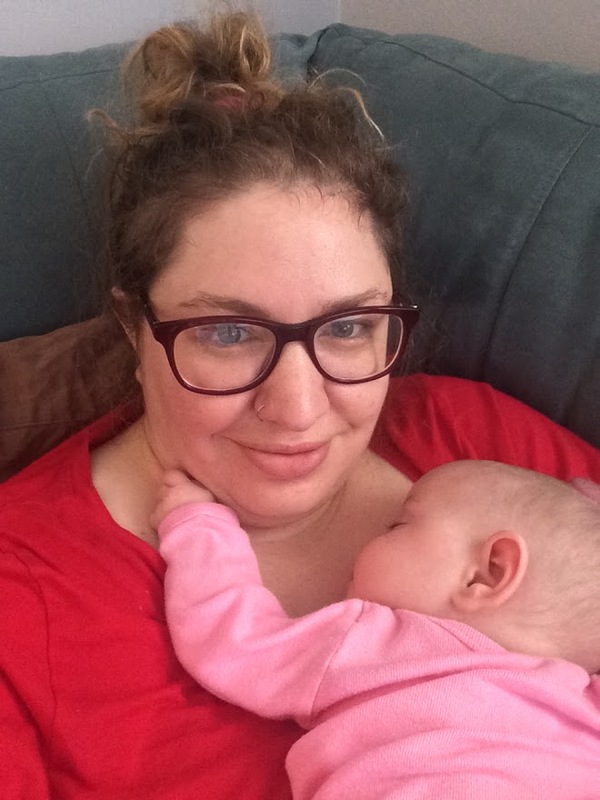 She tolerates it rather well and usually just naps during the 12pm and 4pm feed on my chest. I still have to hold her upright for an hour and a half. Then, at the 8pm feed she falls asleep and stays asleep for the rest of the night. Of course we accidentally wake her to take her to bed and “hook her up” but she usually just groggily smiles and then falls back asleep. I love feeding Bella. It’s a very special time. She snuggles up and I have an hour and a half to just be cozy with her. In the beginning I had to do this A LOT (8x a day shared with Dustin). That made it hard to do anything, including making insurance calls and eat. Now it’s only 2x a day and Dustin does 1. This 3 hours is helpful to slow down and rest. Above is my setup for Bella’s feeds. I’m tethered to her and her pump so I make sure to empty my bladder, get anything I want nearby and get comfy! I just finished a fun book called Girl Wash Your Face. So, sleeping almost all night and not waking up every few hours is amazing. It’s so crazy awesome. BUT, there are some challenges with overnight feeds. Bella moves around a lot and can pull on her button. We alter her sleepers if they don’t have snaps by cutting a hole in them for the tubing. I run these down her leg to help keep her from tugging on the tubing or getting it caught around her neck. It’s actually pretty hard to find a ton of snap sleepers that are warm! So, we use zipper ones and just alter them ourselves. We just recently began running the tubing through an empty paper towel roll to help keep it from away her head. Sometimes if the button is pulled she leaks all over herself and the bed. We have to change out her clothing and the bedding. The friction on her button causes her to break out. She can get skin breakdown near her stoma (stomach hole). So we have to keep bandages on it and rash cream to keep it from bleeding. Sometimes I worry about her silently aspirating the formula into her lungs. If she does it silently after vomiting, I have no way of knowing or stopping the pump if I’m asleep. I’ve had to simply give this fear to God and trust that Bella is big enough to turn her head and spit formula out. 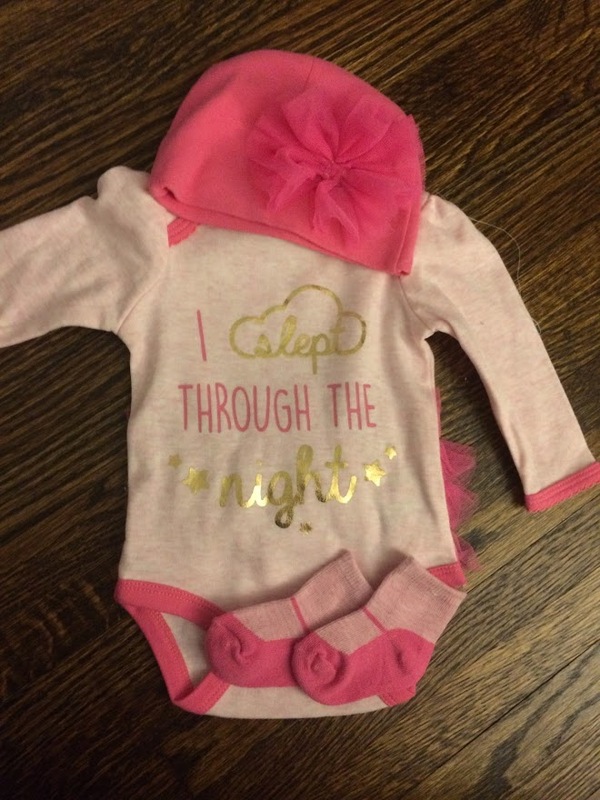 Celebrating with a new “I slept through the night” onesie! Continuous overnight feeds has certainly helped Bella so much. 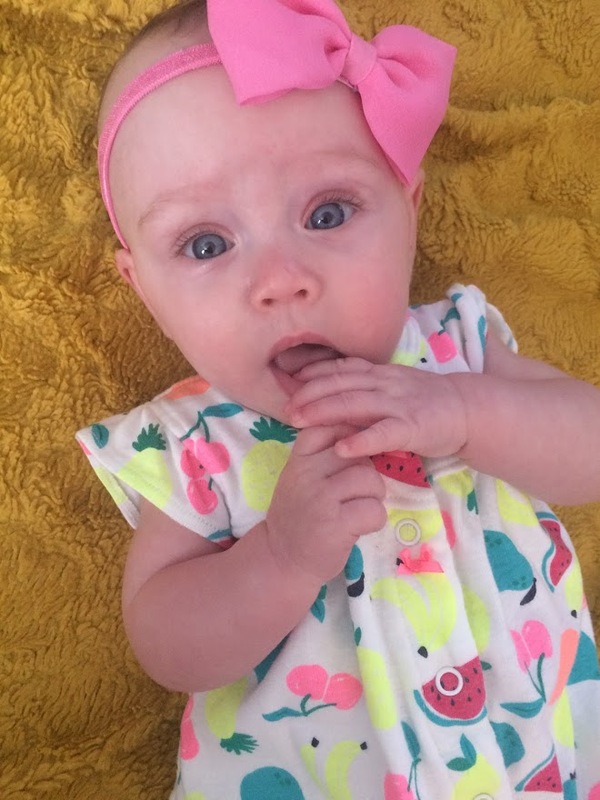 She still vomits at least once during the night or morning, but it’s not a lot of formula! Sometimes she’ll go all night not vomiting and will simply wake up throwing up a small volume! I don’t even have to change her bedding. For us, this is awesome. She was throwing up 5+ times a night before and not gaining the weight she desperately needed. Now, she seems to be hitting new milestones and seems to rested. We’ve put off continuous feeds during the day, to keep her from being hooked up all the time, and hope we can keep avoiding it by doing this. We can also avoid certain medications to empty her stomach quicker and a GJ tube which puts formula into her small intestine! Bella hanging out in bed with her big sister, City Kitty! Also, note, our bed is made! Thanks to the extra sleep I was getting. 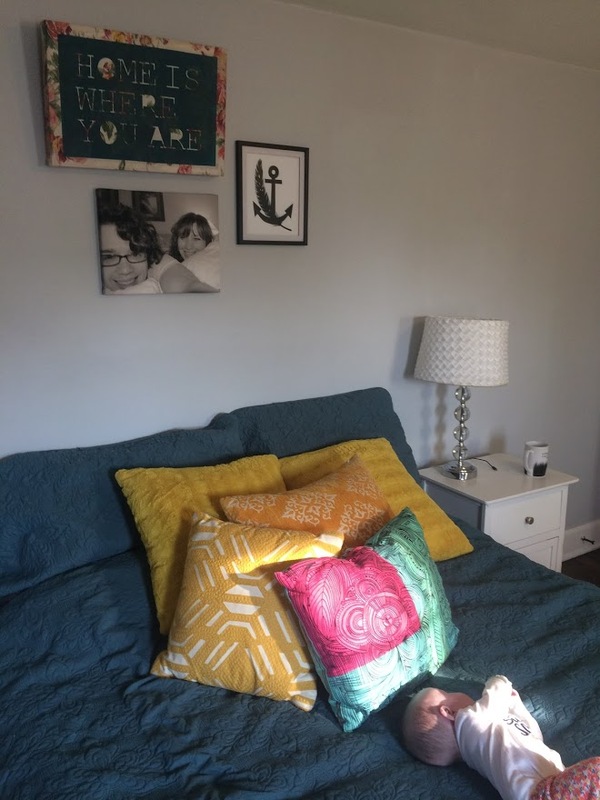 I can’t remember when I took the above pictures, but you better believe the bed is made now almost every day thanks to the restful night and clean bedding with no throw up! It’s so hard to find the time to write…but I make it happen. 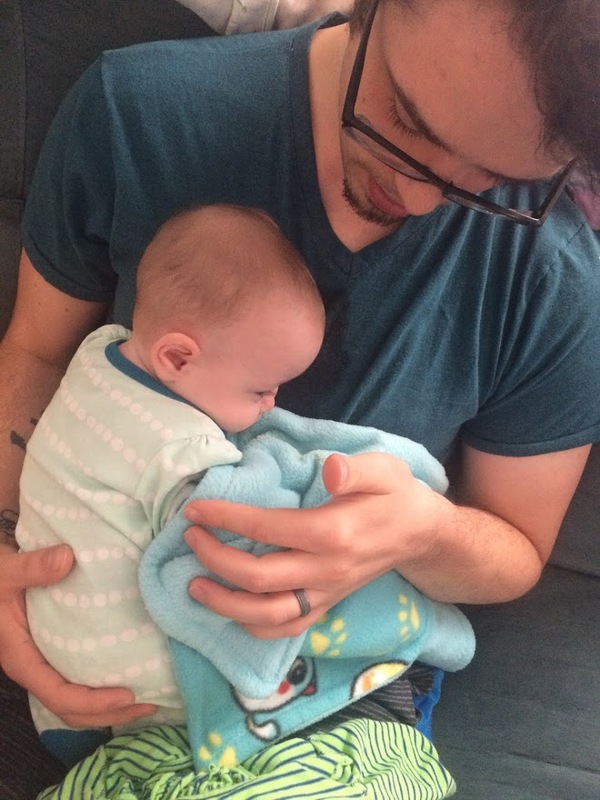 Tonight it’s either a bubble bath or writing a quick update…and I think an update is overdue, especially with the new feeding schedule we’ve acquired. Isabella is doing very well! We have been doing continuous feeds overnight for about a week now. She is sleeping through the night and seems to be growing so much better. She doesn’t vomit at night as much and seems to be able to sleep peacefully while being fed. That’s crazy! This is what a life looks like with Bella. It’s so hard to see her in pain, but we are so glad she is improving. I wanted to share some “realness” with you to get a small glimpse into our daily struggle. Although her tummy still gets upset and she does vomit, it’s not as much. Bella moves more and thus has a pretty good aim for mommy/daddy’s face. Here Bella projected all over the couch and Dustin’s mouth! Ew! She’s in pain a lot from her feeds. Here, below I captured her hurting. 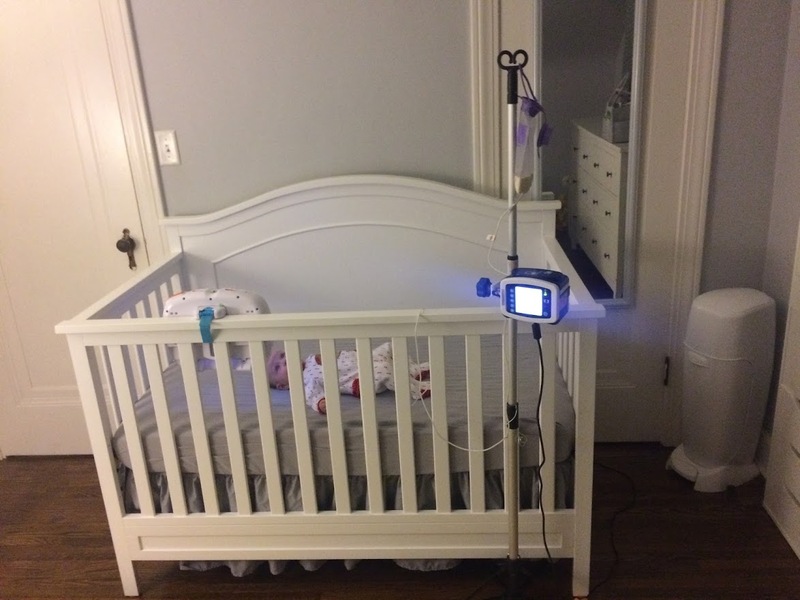 We can’t not feed her, so we have to pause and restart her pump until she can handle it. Above is the amount of laundry we have after just one trip to Akron Children’s Hospital. 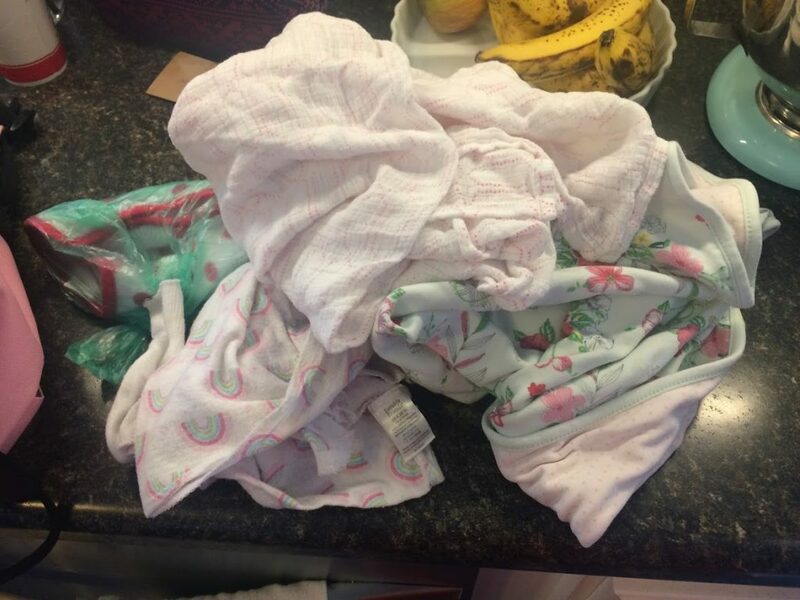 There are usually at least 5 burp cloths, a change of clothes for me and her, and blankets. Every night we change Bella’s bedding (before continuous feeds) sometimes up to 5x a night. Currently we only change it once! Above you can see we are changing out her clothes, burp cloth, and bedding. 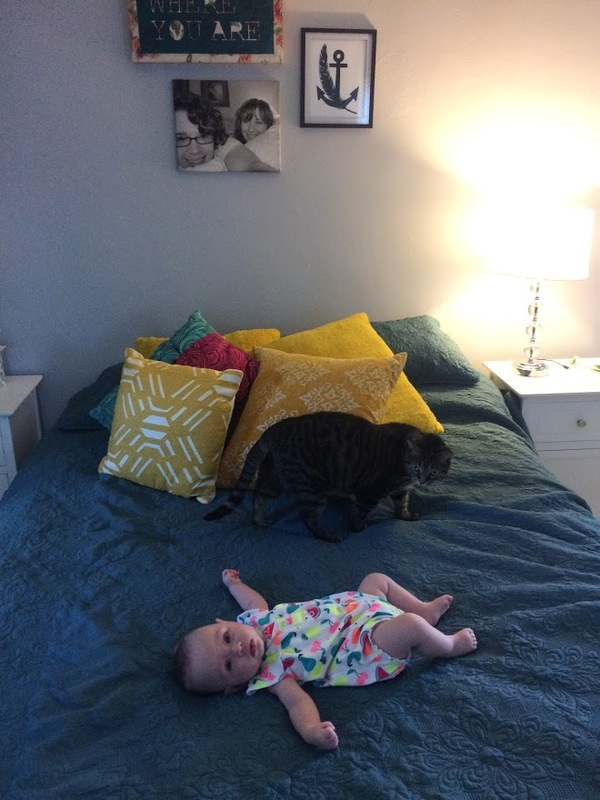 Below, Dustin helping to soothe Bella and catch her vomit. It’s certainly not glamorous, but we do our best to keep a positive outlook. 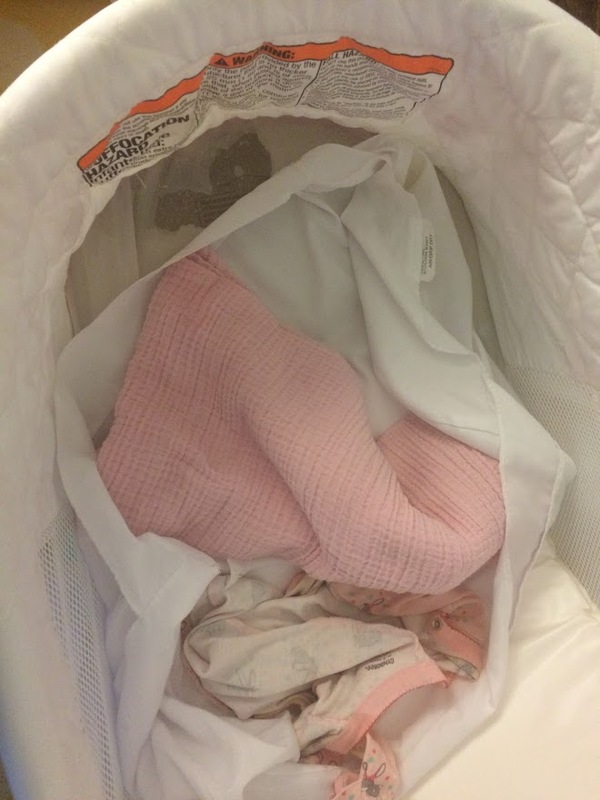 We use a ton of baby wipes and burp clothes. Bella’s still too tiny to give a bath every time she vomits or else she’d be burning a lot of calories she desperately needs to grow. Currently the Gastroenterologists have agreed that Bella has severe GERD/reflux and a premature GI system. We did many tests to explore her vomiting further and nothing critical came to light. At this point, we will settle with the diagnosis. Of course she’s not gaining as well as she should, but she is gaining! We will celebrate this! she moves so much in her sleep! We did the following tests to rule out anything underlying. Full blood work, Upper GI, Gastric Emptying Test, PH Probe, Barium Enema, and multiple Xrays. Her care team and I agree that there’s no need currently to do further testing, such as a scope. Her formula is fortified to be 30 calories per ounce. We use Elecare which is hypoallergenic and easy to digest. We also add Polycal which adds calories. During the day we mix in Beechnut Rice Cereal. We now do continuous overnight feeds. That means Bella gets fed from 10pm until 9am. I’ll have to write much more on this. 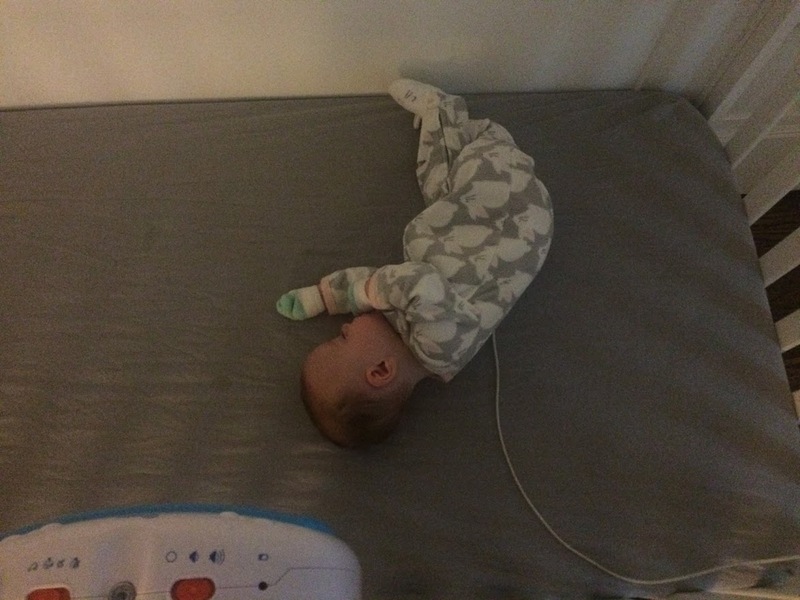 This is a great solution because she can handle a small amount of formula while laying down. This also ensures she’s getting nutrition without throwing it up. She receives 330ml and gets 30ml over an hour. We wake up to refill the bag and also to change her diaper twice. 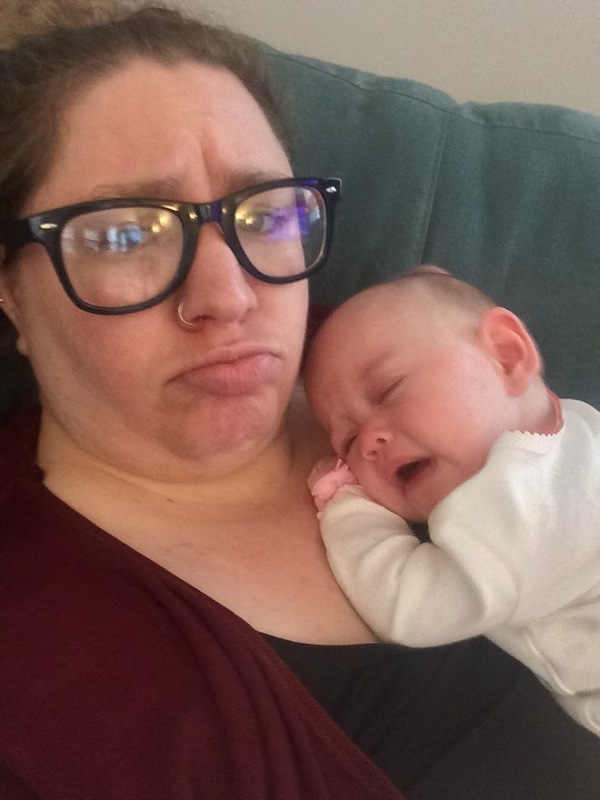 She can usually sleep through it…or wakes up, smiles, and goes back to sleep. She usually vomits once per night. Bolus feeds, or one time larger feeds, are given three times during the day. They happen at 12pm, 4pm, and 8pm. We give her 75ml over an hour. Sadly, she is throwing up quite a bit during the day still, but we know the continuous feed overnight helps make sure she’s not losing too much. Isabella is on medications to help manage her GI issues. She takes both Omeprazole (commonly recognized as Nexium/Prilosec/Etc.) and Famotidine (otherwise known as Pepcid). Both of these work together to help her stomach acid and relieve her stomach upset. Omeprazole blocks the acid production of the stomach and Famotidine, which as I understand it, decreases the amount of acid. Bella throws up when she’s moved after a feed. To combat this, we hold her upright for at least 30 minutes after her daytime feeds. If we sit her down too soon, she usually vomits. This makes each feed at least an hour and a half. One hour for the pump and 30 minutes to hold. I don’t mind cuddles at this point, but she’s getting bigger and wanting to move around more! Many of you asked about her esophagus muscles. We asked as well. We know they are premature and not developed well. This means that she’s unable to protect her airway or keep food down. We know this from a swallow study we did in the NICU. That being said, the specialists have explained that this will improve in time and there’s no need for surgery. Thanks to some amazing friends, (Thank you Mr/Mrs. Hower!) 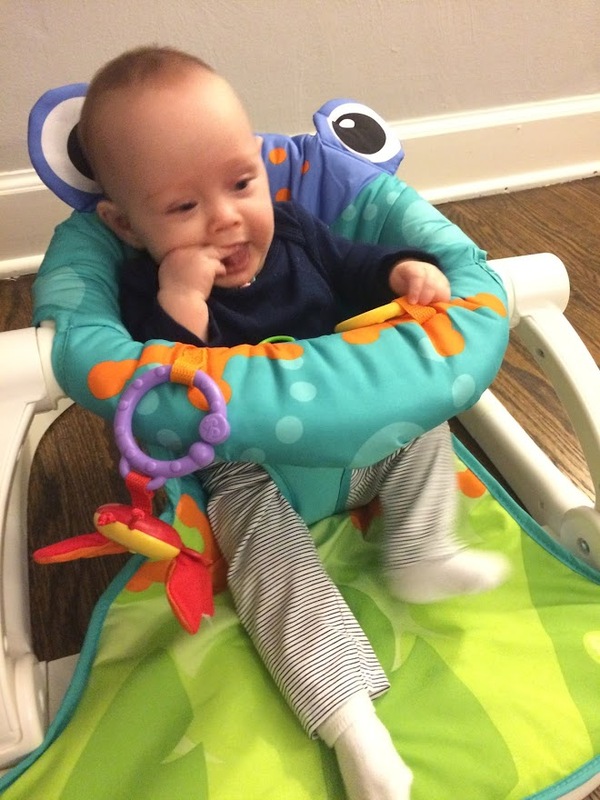 we now have a sit-me-up-seat that can help her eat while playing. I’ve been working with her to get used to it and so far she loves sitting in it. Hopefully soon she can eat while in it and not fall asleep! 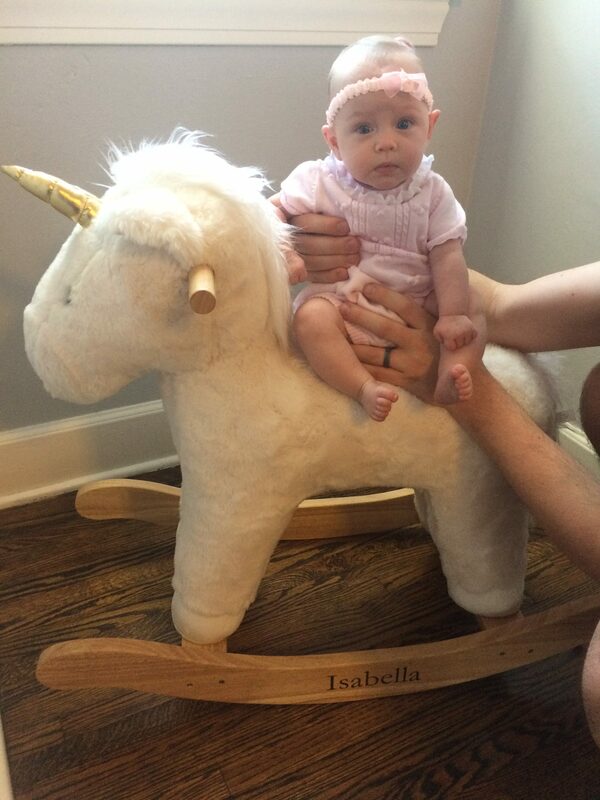 Other solutions are still on the table for Isabella. 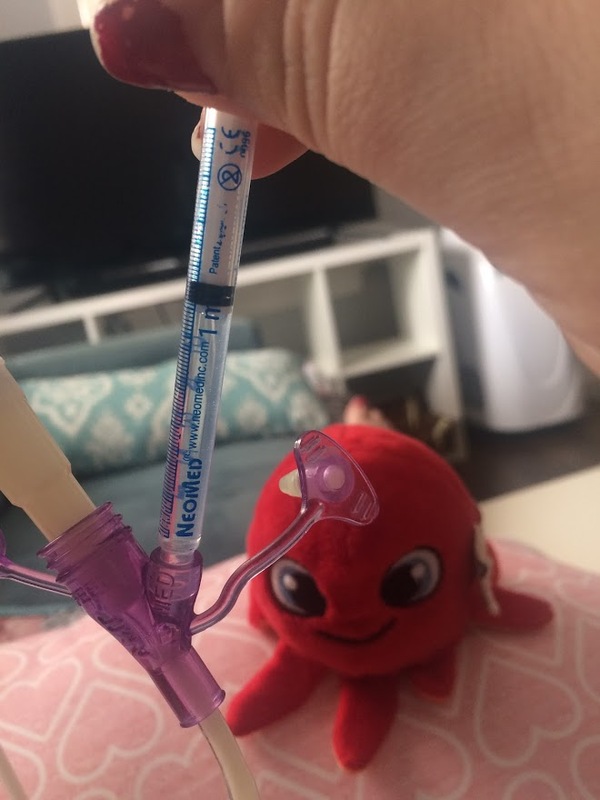 We can switch to continuous feeds all day and all night, utilize medications that help her stomach empty faster, or have a GJ tube inserted in place of her current Gtube. For now, we are going to continue with the overnight feeds and pray we can avoid other options. Of course we are willing to explore them if needed. Thank you again for all of your love and support. I’m so sorry I’m not able to fully respond to all comments. I try to but sometimes I’m just so busy! I read each one and am so moved by all of your continued support and love for Bella. I am so excited that as she gets bigger she can meet many of you! 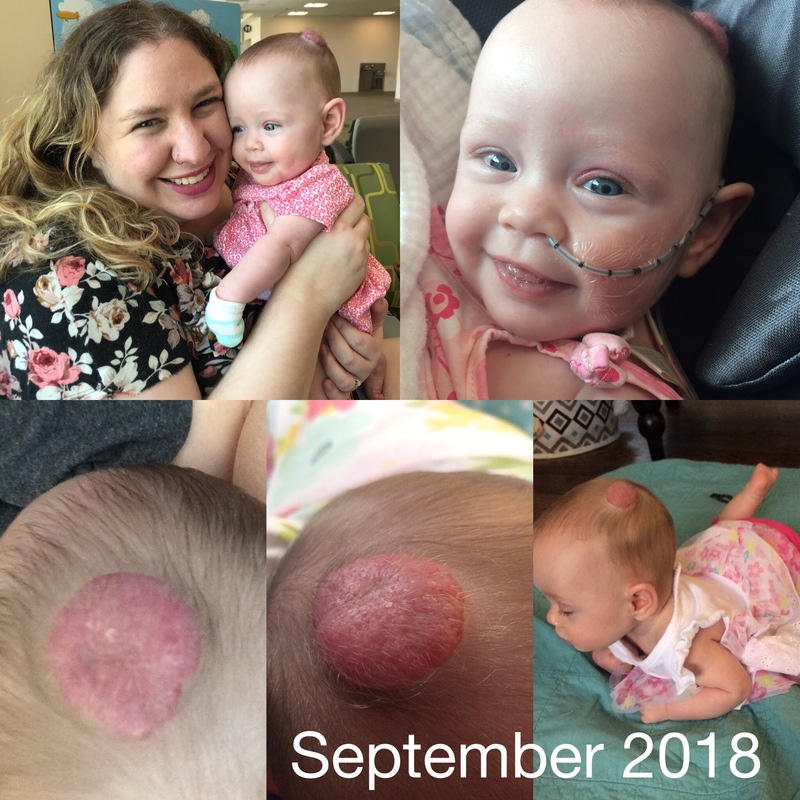 We’ve been on our Hemangioma journey for quite some time now. I’ve learned a lot about vascular birthmarks. I’ve also learned a lot about medications. We made the decision to treat Isabella’s Hemangioma (the large red tumor on her scalp) because it was ulcerating and causing harm to her. That being said, you can read more about that decision and meeting with a top Pediatric Dermatologist here. 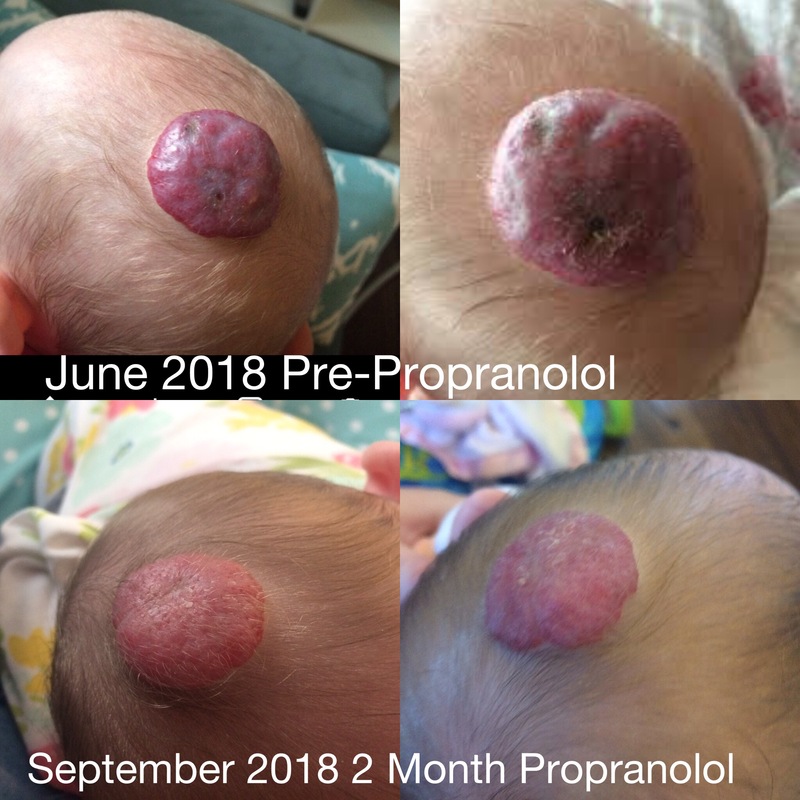 Isabella has been taking propranolol for almost 3 months now. This is a blood pressure medication that helps to treat Hemangiomas, which are full of blood vessels. We are very happy with the progress and anticipate the birthmark fading more and disappearing by the age of two. 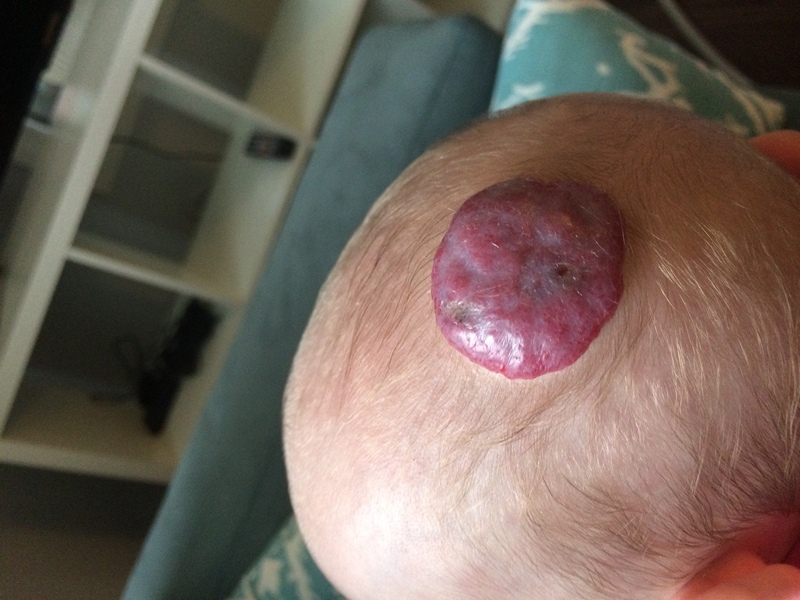 Above: The Hemangioma before treatment. She is 4 months here and it was beginning to have skin breakdown (ulceration). You can see the breakdown where it’s dark. It was also very red and puffy. The space under the birthmark where the skin was, was elevated. Above: The Hemangioma is healed almost completely from ulceration. The coloration is lighter and it has a lot of hair growing out of it. She’s about 7 months. Here is the side-by-side. The top is when it was at its worst and the bottom is how it looks today after treatment. We gave/give her propranolol and also used a topical antibiotic to prevent infection. I’m so thankful I made the right decision and listened to my mother’s instinct. 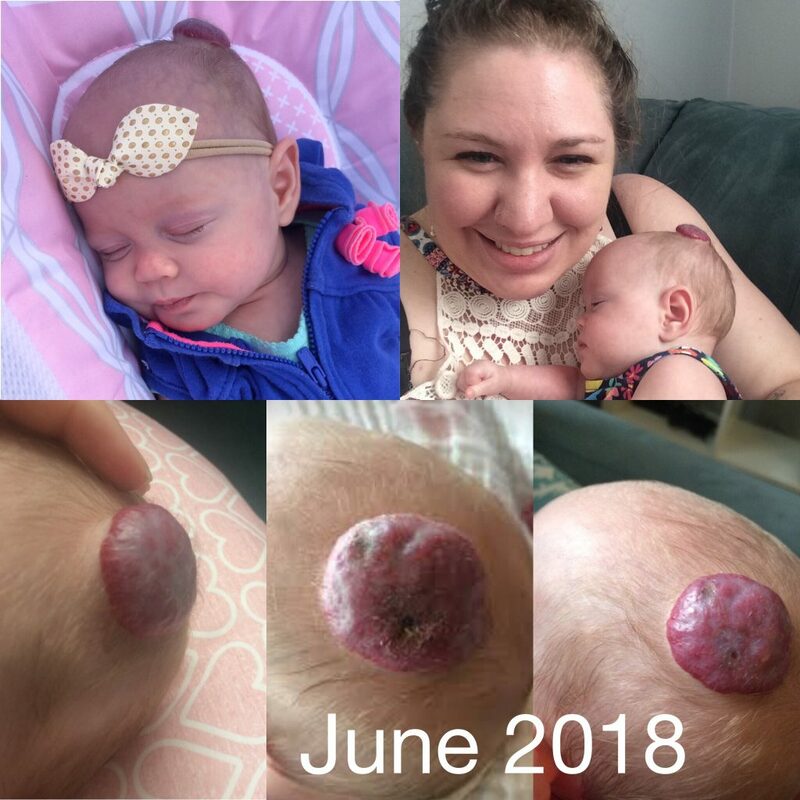 We were told by a nurse practitioner that the darkening spots were nothing to worry about and that she had seen hundreds of birthmarks like it before. I wanted to make sure, so I sent images of the spots to our Pediatric Dermatologist. He immediately got back to us and put her on an antibiotic and had us come in for an urgent appointment to begin treatment. He explained that it was, indeed, ulcerating and that it was very dangerous. If your child has a Hemangioma, please seek out medical advice. It’s best to reach out to a Pediatric Dermatologist who has experience with vascular birthmarks. In many cases these will not need treatment and will fade on their own. (I personally know two friends with preemies who have them). In other cases, like Bellas, there could be skin breakdown and cosmetic implications (like a bald spot). If a baby has 5 or more, it’s common practice to do an ultrasound to rule out internal ones as well. Isabella went through this and doesn’t have any internally. Lastly, thanks for your prayers and here is how God’s answered them since my first post on Bella’s birthmark. 1.) This birthmark doesn’t ulcerate any further and that with treatment we can avoid pain and discomfort. The birthmark didn’t ulcerate any further. It began to dry up and actually scabbed over. Bella hasn’t felt any pain in 2 months. 2.) Bella tolerates the medication. Bella has tolerated the medication fine! Her hands and feet are sometimes cold because of the blood pressure medication, but no other symptoms are noted. Sometimes she’ll vomit a dose, but she vomits all the time, so we don’t see any correlation. 3.) That we would be able to handle the magnitude of treating such a little one with such a serious prescription. That we would be extra careful with doses and track it well. The medication was/is super scary to use, but it’s become habit. We double check the dosing and make sure it’s given with her feed. We use syringes and give it to her through her Gtube. At first we tracked it with an app. Now, we know exactly when she gets it and have it written on a schedule board in our kitchen with her medications. We also have the dose written on the board. I keep a screenshot of her medications/doses on my phone as well. 4.) Also, pray against any internal hemangiomas. We have no reason to believe she has any, but it is a possibility. We did an ultrasound and there were NO internal hemangiomas! There was a strange spot on her liver which we have to go back for another scan in a month or so, but other than that, no issues. The radiologist thinks it was just a shadow and after a full blood work work up, our GI specialist agreed it’s nothing to worry too much about. 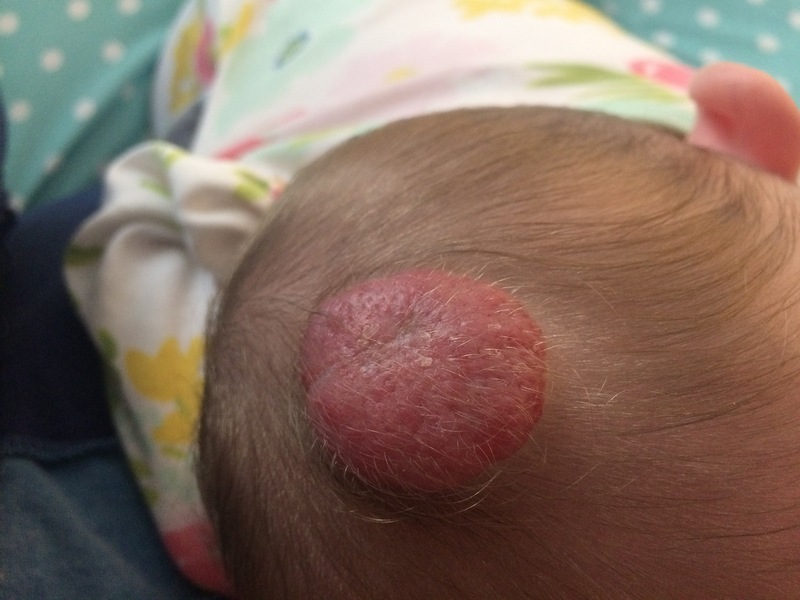 Have more questions about Bella’s Hemangioma? Feel free to reach out. Here’s a quick resource as well.